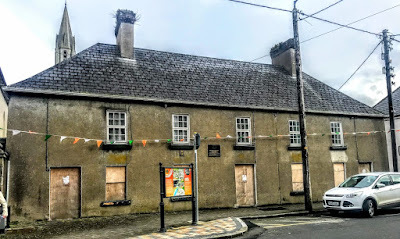 Between Trinity Chambers, the former Saint Catherine’s Church on South Street in New Ross, and the neglected courthouse on Priory Street, Trinity Hospital or the Hospital of the Holy Trinity is an interesting collection of houses that tells the story of an Elizabethan charity and a Co Wexford foundation dating back almost 450 years to the late 16th century. 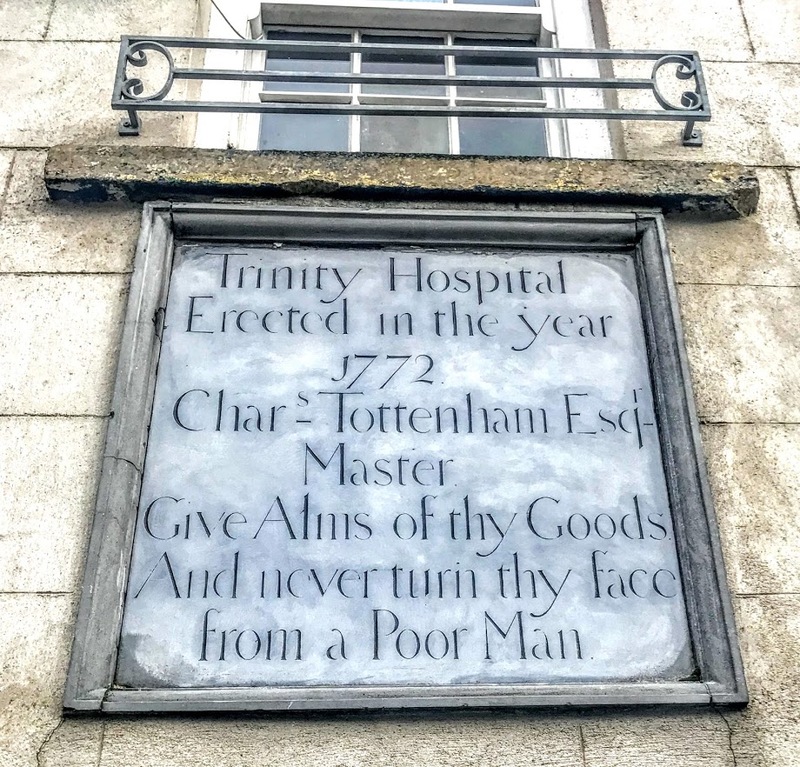 The Trinity Hospital was founded in 1578 by a bequest of a local merchant, Thomas Gregory, a merchant who had been granted the sites of all churches and monasteries in New Ross. The Hospital of the Holy Trinity was incorporated by a charter granted by Queen Elizabeth I in 1584, when the sites of two churches – Saint Saviour, which had been granted to Dunbrody Abbey in 1370, and Saint Michael – were transferred to the new foundation. The hospital or almshouse was supported by an income from lands of Glen Saint Saviour – now known as called Glensensaw – in Rosbercon, on the west bank of the River Barrow. 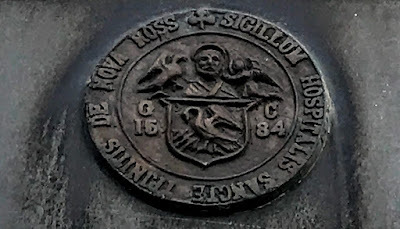 The seal of the Hospital of the Holy Trinity bears the initials ‘GC’ of George Conway, the first master, and the date 1587. The tomb of Patrick Conway, ‘formerly burgess of the New Town of Ross,’ who died in 1587, and who perhaps was the father of George Conway, and his wife Katherine Archer, could be seen in Saint Mary’s Church. The conditions for entry to the hospital were simple: poor women who were in need, and natives of New Ross or residing in the town for 12 months. Religion was to play no part in considering candidates for residence. At the time, it was alleged that many hospitals were continuing as chantry chapels, and it was suspected in its early decades that the former priests of Saint Saviour’s continued to say Mass in Trinity Hospital. At first, the hospital or almshouse consisted of six houses in Priory Street, providing accommodation for 14 poor women. Each woman had two rooms and an annual allowance of £18.1. Almost 200 years after its foundation, Trinity Hospital was rebuilt in 1772 by Charles Tottenham (1716-1795) of nearby Delare House. By the 19th century, New Ross had several charitable institutions, including the Fever Hospital, founded by H Houghton of Ballyane and completed by his widow in 1809, and the Vicar’s Almshouse, provided accommodation for three poor Protestant widows and endowed by Charles Tottenham and Lord Callan, as well as a Temperance Society, founded in 1829 and said to be the first of its kind in Europe, a Bible Society founded in 1804, and the Rumsey Lending Library, founded with a grant from Mrs Rumsey, the wife of a doctor in Amersham, Buckinghamshire. The houses at Trinity Hospital were renovated at the beginning of the 20th century, but they retain many of their 16th and 18th century architectural features. These include their compact rectilinear plan form, their feint battered silhouette, the solid massing, the timber sash windows, the uniform proportions of the windows, the high-pitched roofline, and glazed tongue-and-groove timber panelled double doors or replacement iron double doors. One of the houses has ground floor openings remodelled to accommodate a pair of square-headed carriageways. The range also included an extension that possibly formed part of larger living quarters for the governor or master of the hospital or almshouse. Almshouses such as these are found in many English towns and cathedral cities. I was reminded, quite naturally, of Saint John’s Hospital in Lichfield. But they are a rarity in Irish towns. Although the ground floor of the original house is now boarded up, Trinity Hospital continues to provide a link with the Tudor period in the history of New Ross and it is an important component of the late 18th century architectural heritage of the town. In a letter to The Irish Times in 2004, Breda Fitzgibbon of New Ross, writing as the Representative of Thomas Gregory and Master of Hospital of the Holy Trinity, challenged a claim that The Royal Hospital Donnybrook, founded in 1743, is the oldest charity in Ireland. 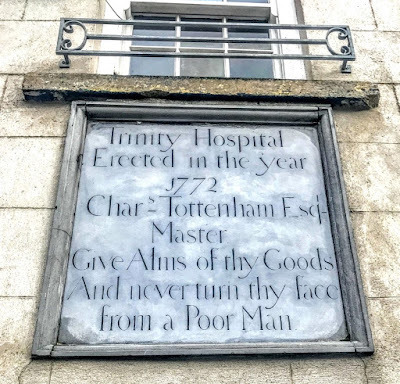 She pointed out that the ‘Master Brethren and Poor of the Hospital of the Holy Trinity,’ was founded in the late 16th century by Thomas Gregory and granted a Royal Charter by Elizabeth I. With voluntary help, this charity has continued the work of caring for the poor since its foundation without State aid or health-board subvention thanks to the continued support of the people of New Ross who have responded generously with their support.